I often like a good chocolate milkshake for a liquid pudding, especially if I've had a big dinner and am unconvinced I can fit anything else in. This Canny All Natural Chocolate Milk was produced in Newcastle, which is evident from the references to that part of the country in various places on the carton. Cardboard carton I may add, not in a canny can! The carton also sports how healthy a drink it is, having no added sugar, no artificial colours or flavours, being a good source of calcium and protein, as well as vegetarian friendly and gluten free. So what does it taste like? After a good shake on opening there is a good chocolatey smell to this chocolate coloured milk drink. On taste there is a good hit from the chocolate with an added sweetness from the date nectar, and a very mild touch of saltiness into the aftertaste. 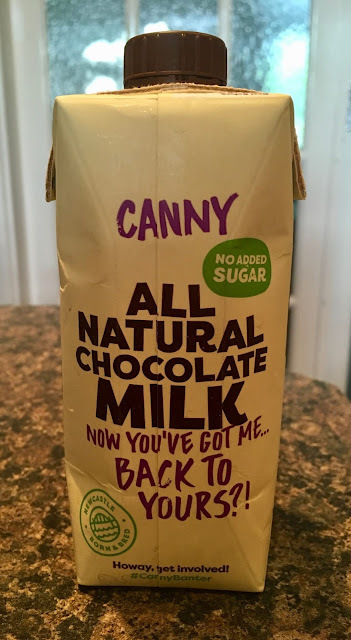 Moreish and relatively low in calories, this Canny All Natural Chocolate Milk drink makes for a good liquid pudding after lunch or dinner. The 330ml carton contains 83 calories per 100ml, with 2.2g of fat, 9.3g of sugar, and 0.24g of salt. Ingredients included; British semi skimmed milk (89%), date nectar (7%), cornflour, cocoa mass, natural flavourings, and sea salt.